I've really enjoyed these ebook tie-ins to the Doctor Who television show. They're nice little nods to the fans and do help to expand the story in their own way. 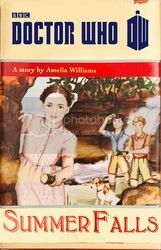 In the first episode of the second part of season seven, "The Bells of Saint John", one of the children that Clara is taking care of as nanny is reading a book titled Summer Falls by Amelia Williams, who Doctor Who fans will know as Amy Pond, the Doctor's previous female companion. (And just in case some readers aren't caught up, I'll not reveal any spoilers as to why Amy isn't traveling with the Doctor by this point.) Clara asks about the book Artie is reading, says it's a good one, and it was basically left at that. BBC then released an ebook version of the book, and what follows would seem to be Amy Pond's love song to the Doctor in print form. The story revolves around Kate and her adventures trying to keep the The Lord of Winter at bay. The Doctor clearly makes an appearance, but he his role is more of a background one, as Kate and her reluctant friends try to solve the mystery of the Lord of Winter. I really enjoyed this quick read and obviously for Whovians, there are little Easter eggs spread throughout. Whovians may be the only ones to get some of the inside jokes in the story, but it's written well enough that I think even the most causal fan of Doctor Who or general reader will be able to enjoy the story.